Neighbors in one Nassau County community say they’re fighting back against a new rule that prohibits street parking. The rule was implemented by SEDA Construction in July. Neighbors tell Action News Jax it was done to accommodate ongoing construction of nearby homes in the Hideaway Lakes subdivision. SEDA is actively enforcing the rule. Neighbors say they’ve seen tow trucks in the neighborhood multiple times per week. 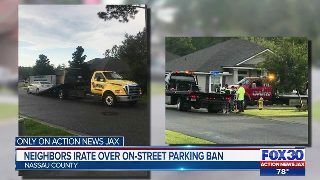 Pictures sent to Action News Jax show cars getting towed right in front of their homes. “It seems a bit ridiculous,” said Paul Piavis. One woman tells Action News Jax the new rule is more than an inconvenience. Her son has autism and requires in-home medical treatment that now can’t show up because she says there’s nowhere to park. “If this rule would have been in place six months ago, we would have cancelled our contract and we would have looked elsewhere,” she said. Action News Jax spent a day speaking with residents in the Hideaway and Hideaway Lakes subdivisions. Nearly all we spoke with said they were against the rule. One woman reached out and said she supported it because having no cars in the street keeps the neighborhood safe and allows access for emergency vehicles and school buses. SEDA has yet to respond to calls or emails from Action News Jax. Neighbors say they’ve sent emails to the Home Owners Association management company, which said they don’t have any authority over the parking. Until the land is fully built up, SEDA retains much of the HOA power. In the meantime, neighbors say they plan to pursue legal action.